The intriguing remark was made by Lord Martin Rees, a leading cosmologist and astrophysicist who is the president of Britain’s Royal Society and astronomer to the Queen of England. Rees believes the existence of extra terrestrial life may be beyond human understanding.“I suspect there could be life and intelligence out there in forms we can’t conceive. Just as a chimpanzee can’t understand quantum theory, it could be there as aspects of reality that are beyond the capacity of our brains,” Rees observed. An alien might have four limbs, just like we humans. Or it might sport 17 tentacles, depending on evolutionary pressures. We can observe, quantify and describe such things. But how can we truly gauge the workings of an alien mind? A new paper, publishing in Acta Astronautica in February, and reported in NASA’s Astrobiologyoffers a preliminary exercise meant to get us to think outside our own box in assessing alien intellect. The exercise is called COMPLEX, which stands for “COmplexity of Markers for Profiling Life in EXobiology.” The project compares various non-human intelligences—including animals, microbes and machines—to each other (rather than humans) and across several categories of behavior and mental capability. “The goal of COMPLEX would be to prepare ourselves for assessing other species if we find life in space,” said Denise Herzing, the study’s author and a biologist at Florida Atlantic University. The research could be critical to astrobiology, which relies heavily on understanding Earthlings to gauge what’s possible on other planets. Across the dizzying array of Earth’s biota, “intelligence” is an awfully tricky thing to pin down. Historically, we’ve often defined intelligence in other beings based on how much it resembles our own. We collect sound patterns from whales that could qualify as language, seize upon rudimentary tool use by crows, and admire the social complexity of elephant societies. Viewing these non-human intelligences through a human lens, however, might be shortchanging these creatures’ intellectual abilities. Furthermore, when applied to non-Earthly life forms, our bias towards human intelligence’s characteristics might really miss the mark. Herzing’s background has well-prepared her for such an astrobiological undertaking. She is the research director and founder of the Wild Dolphin Project, an organization that has studied a dolphin pod for nearly three decades to learn about the animals’ behaviors, social structure and more. Many scientists consider dolphins (technically, porpoises; “dolphin” is a common name given to the animal) among the most intelligent creatures on Earth, perhaps on par with non-human primates. For the most part, the study of dolphin intelligence has hewed closely to the standard methods we’ve used to evaluate other species’ smarts. We have focused on physical traits, such as brain size relative to body mass. We have also put species through their paces doing the sorts of things we consider hallmarks of our own superior brainpower, like puzzle-solving and understanding gestural or acoustic language. A third measure of intelligence, that of complex signaling and communication, has recently gained ground. Thanks to breakthroughs with pattern recognition by computers along with other software, we now have the tools to gather and parse the data necessary for assessing this dimension. An example is comparing long segments of dolphin vocalization to listen for repeated elements and apparent syntactical arrangements amidst the clicks, whistles and squeaks. Through these investigations, we have discovered profound examples of human-like intelligence in non-humans, knocking us off our lofty pedestals, to some extent. “Humans have had to give up some of what we thought was ‘unique’ to us, as animals started showing their true abilities,” said Herzing. As usefully humbling as these revelations are we have still largely failed to judge animal intelligence on its own terms, so to speak. Inarguably, our ability to repurpose the physical world’s contents, from the quarried stone of the pyramids to the machine-fashioned silicon in our computers, is an astounding display of wherewithal not possessed by any other Earth-dwelling organism. But the engineering marvels of a termite mound—internal temperature control, ventilation, cultivated fungal gardens—should not be sneezed at, either. As individuals, termites are not very smart or capable. But as a collective “hive mind,” the creatures accomplish incredible feats. “I think someday we may be able to just see ourselves as one of many species who has evolved a few specialties, like vocal language and manipulation of things, instead of looking at ourselves as the only species that are smart, because we think having language is smart,” said Herzing. To give appropriate consideration to other aspects of intelligence, Herzing developed COMPLEX. She recruited a small number of scientists, from astrobiologists to a computer scientist, to weigh in on five dimensions of intelligence across several distinctly non-human entities. The COMPLEX dimensions are: “encephalization quotient” (neural complexity assessment), “communication signals” (complexity of signal coding), “individual complexity” (the presence of personalities, essentially), “social complexity” (whether living as a group or solitarily) and “interspecies interaction” (the character of external relationships). Each of these categories was broken down into further, more defined attributes. To cite one example from each, respectively: neural specializations, natural repertoire, role flexibility, alliances/cooperation, and cross-species altruism. If some of the preceding terms and ideas do not ring bells when one thinks of indicators of intelligence, that’s the point. “Since most criteria for human intelligence emphasizes language, cognition and numerical competence, other dimensions of information processing were used to scale organisms in this exercise,” Herzing wrote in her paper. Experts assessed five sources of conceivable intelligence for the study, drawn from categories created by the University of Emory’s Lori Marino and York University‘s Kathyrn Denning for the SETI Institute‘s “Intelligence in Astrobiology” project. The specific assessed examples were dolphins, octopuses, bees, microbes and machines. Each of these entities, in different ways, successfully copes and exploits its environment for survival (or as might be said for the machine, to function as programmed). Instances of attributes include the complex communications in dolphins, the associative learning in octopuses, the “waggle dancing” bees use to tell their fellows the location of food, the group-beneficial behavior within microbial colonies, and machines’ computational power. Overall, with the scores in, the COMPLEX exercise showed how the five non-human intelligences stacked up against each other. Each demonstrated areas of high and low potential, with some interesting similarities and dissimilarities coming to light. Both bees and machines scored highly in the communication signal and social complexity categories. Dolphins, octopuses and machine all racked up big encephalization (neural complexity) points. Microbes—easily mistaken by us humans for lacking social abilities—scored relatively high in the interspecies interaction category. The results suggest ways we could try to define (and re-define) the elusive concept of intelligence in beings unlike ourselves. “COMPLEX was a beginning exercise to see how we might begin to compare types of intelligence without depending on human-only characteristics,” said Herzing. A natural extension of these preliminary findings is to create further criteria and plug in other intelligences. Future versions of COMPLEX could also seek to address oversimplifications of painting a type of creature with too broad a brush. For example, “microbes” is an umbrella term for plankton (plants and animals), fungi, bacteria, Archae and more, covering a continuum of behavior and activity. Thus, all microbes would not rate the same. Herzing said it is one of the goals of COMPLEX to tease out such divisions. A challenge with COMPLEX, as well as any attempt to assess intelligence in others, is dealing with our own inherent biases. How can we not judge something by human standards, looking through human eyes and calculating with a human brain? The machines example is a particularly tough one—after all, they are by us, for us. A final issue with the COMPLEX approach is that it requires input from experts on the relevant species or intelligent entity. Assessing well-studied, non-human intelligences here on Earth could open up new conceptual windows. But it might not automatically lend itself to cracking the code of potential alien intelligences, especially ones just “glimpsed” by our robotic probes or eventual interplanetary and interstellar astronauts. Every little bit of insight could prove helpful in getting us ready—and willing—to consider the scope of alien intelligences similar to or radically dissimilar from our own. After all, we struggle to grasp just what intelligence is, even when it’s right under our noses. 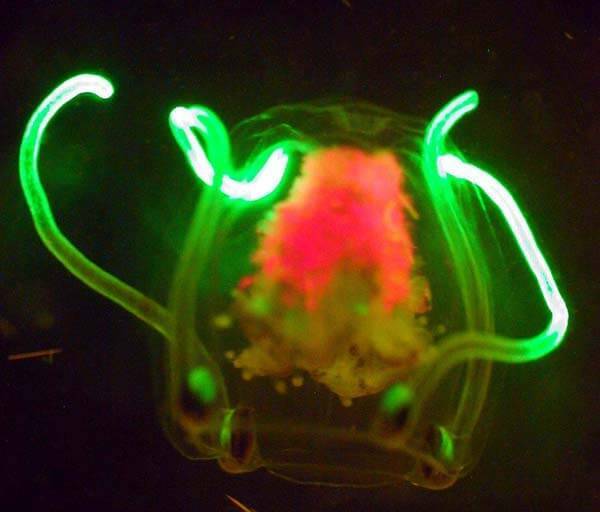 The “alien-like” image at the top of the page shows a small planktonic jellyfish with bright green-fluorescent tentacles. The red fluorescence in the middle of the jellyfish comes from chlorophyll in the ingested algae. Image courtesy of Mikhail Matz, Islands in the Stream 2002, NOAA-OER. Could These Weird Space Objects Be the First Proof of Intelligent Aliens?